The prophets of doom said don't go! You'll suffer! It'll be unbearable! Summer in Seville is hell! But I insisted. So here I am. In the blazing sun. Dripping sweat. And the heat really is incredible! On arrival at the hotel (in an air-conditioned taxi from the air-conditioned station) I was in a hurry to see the rooftop swimming pool and bar. As I went out on to the roof the wall of heat that hit me was shocking. There was a fair breeze up there, but that seemed to increase the effect — imagine a fan oven and you'll get the idea. I didn't stay long as I had no sun protection. So I went back to my room and prepared to enter the inferno. I suppose I'm not the first person from Hibernia — the "wintry land" that the Romans weren't interested in conquering — to come to Andalusia in summer and risk damaging my fair complexion. And boy, is it worth it! This city is more beautiful than I had imagined from reading guide books and hearing other travellers' stories. I was prepared for the cathedral's bell tower (the Giralda) that had once been a minaret; the Alcázar palace that was originally a Moorish fortress; the dozens of churches; the winding streets and the many small squares with huge trees that provide merciful shade. 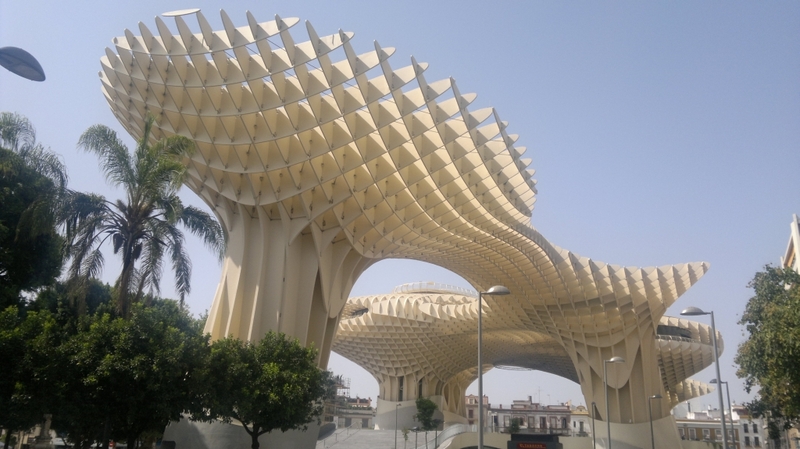 But no-one told me about the Metropol Parasol! Situated in Plaza de la Encarnación, it is apparently the world's biggest wooden sructure. The locals call it las Setas de la Encarnación (the mushrooms of Encarnación). It houses a market, restaurants, a theatre and the Antiquarium where Roman and Moorish remains are displayed. I'm going out now to see if I can find some interesting local fare. Tomorrow I'll look for an egg to test out that famous theory. Courage pour cet enfer sévillan!!! J'y suis allé la dernière fois en 92 pour l'Expo. Au fait que reste-il de cette Expo, dans l'ïle de la Cartuja ? La parasol en bois, impressionnant....As-tu goûté le fino ?